Using Loki, AirGon’s precision positioning system, very accurate georeferenced imagery can be collected using DJI drones over an area of interest. The positions from which those photos are captured are output from the ASP Suite workflow as geographic locations, described by latitude, longitude, and altitude coordinates. Image-to-point cloud software applications such as Agisoft PhotoScan and Pix4D make these into accurate 3D models and support conversion to projected coordinate systems. Those projected systems change latitudes and longitudes into easting and northing coordinates, which are much more practical for surveying tasks. However, the supported systems are limited to national and state grids or other predefined systems. A common example would be the U.S. State Plane system. While great for the exchange of data between GIS applications, many sites have large-scale projected systems defined just over the local site, which does not match existing national and state grids. We refer to these as local coordinate systems, and while local easting and northing image locations can be input to PhotoScan, Pix4D, etc., those applications do not support converting geographic coordinates to local projected coordinates. AirGon has recently been working with Rio Tinto, a large international mining company, to implement local coordinate system support in the AirGon ASP Suite. The Kennecott mine in the Salt Lake area of Utah is referenced to a local coordinate system that has been in use for many years. The local system is rotated 32 degrees from the Utah Central State plane system, and uses slightly different scales than does the grid system. Local heights are also slightly different from the state plane NAVD88 heights, with local heights being referenced to a plane instead of an ellipsoid or geoid. To provide output from ASP Suite in the Kennecott mine coordinate system, a solution is being developed that allows users to enter matching pairs of geographic and local coordinates to define a local coordinate system. Using coordinates pairs supplied via a comma-separated value file (.csv), the new ASP Local Coordinate System Manager computes a temporary transverse Mercator projection over the site area to obtain projected easting/northing coordinates. Then, a least-squares solution is computed to obtain the translation, scale, and rotation values that best fit the temporary projected coordinates to the site’s supplied local coordinates. Finally, a second least-squares planar solution is used to transform from the GNSS-derived heights to local heights. The parameters for these transforms are saved in the Local Coordinate System manager as a “named” local system and can be applied as a final step in ASP processing so that local eastings, northings, and altitudes are output for the collected images. When these are ingested into the image-to-point cloud applications, the output point cloud and orthomosaic will be created in the local coordinate system. The new Local Coordinate System Manager was released with ASPSuite version 2018.1.59.0. 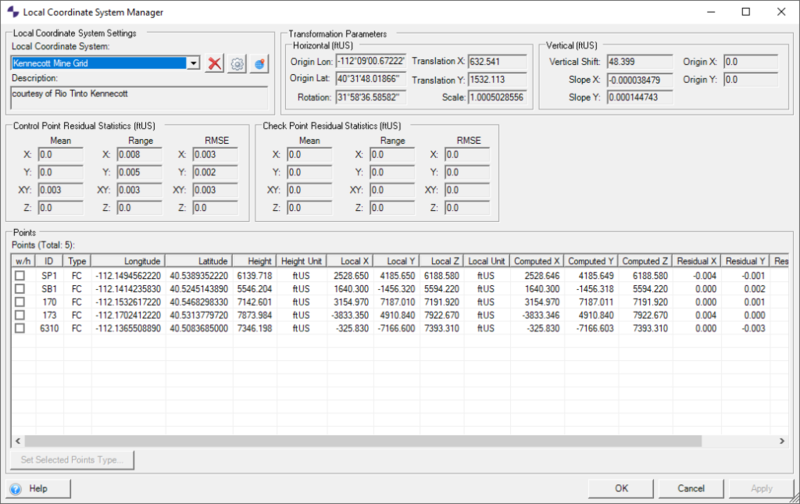 Instructions for using the Local Coordinate System Manager can be found in our ASPSuite User Guide. This entry was posted in AirGon Tools, Tips and Workflows and tagged ASPSuite, Local Coordinate Systems. How to verify if the Maxtenna is functional after a crash? When is the expected release date for this tool? I could really use this now! The local coordinate tool has not been officially released yet, but we do have a way for you to test the alpha implementation in the latest version of ASPSuite. If you’re interested, contact support@airgon.com for instructions.